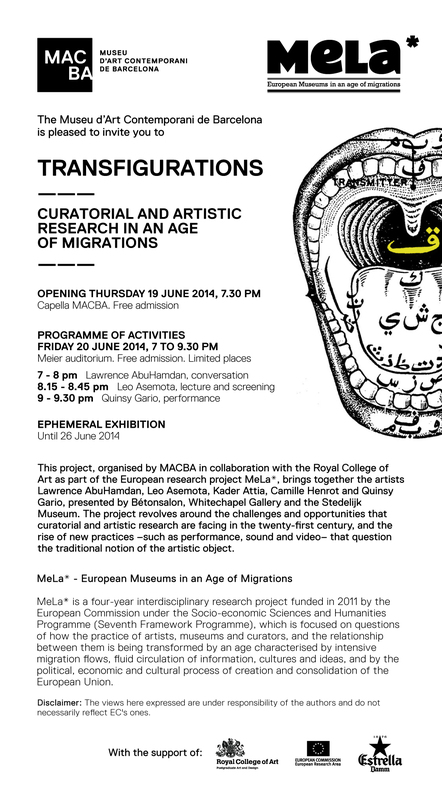 Within the framework of MeLa Research Field 04, the fieldwork developed by the Royal College of Art into curatorial and artistic research culminated in the exhibition “Transfigurations: Curatorial and artistic research in an age of migrations”. How are globalisation, digital media and changing patterns of migration affecting our understanding and experience of the contemporary work of art, and how are contemporary artists engaging with curators to think about the condition of the contemporary through their work, its display and collection? How are curators working with new forms of artistic production, particularly ‘immaterial’ works of art, that fall outside conventional forms of display, collection and archive? In particular, the research exhibition reflected on the challenges and opportunities of curatorial and artistic research in the 21st century, and the rise of new forms of practice such as performance, sound, and video which are both expanding the range of artists’ interests and challenging conventional ideas of the ‘art object’ in museums and galleries. Following what had been described as ‘the curatorial turn’ and ‘the educational turn’ the exhibition considered how complex the interface is between issues of representation, globalisation, collection and object, curating, programming, audiences, and technology. The exhibition took place at MACBA - Capella, Museum of Contemporary Art of Barcelona (Plaça dels Àngels 1, Barcelona 08001, Spain) on Thursday 19 June, and was on display from 20 to 26 June 2014.